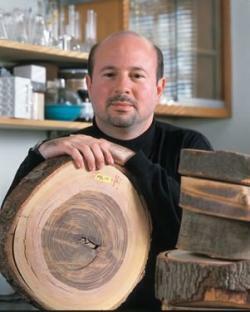 Anti-science defamation: Climate scientist Michael Mann lawsuit to move forward. Michael Mann is a climate scientist who was flung into the spotlight when he and his colleagues published a graph several years ago showing the explosive growth of global warming over the past century or so. The original work has been updated and extended many times, by many different scientists, and each time the pattern of results has been supported and strengthened. 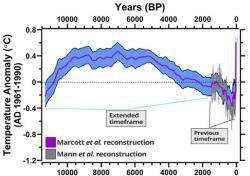 Additional data going back 11,000 years show that we are experiencing an unprecedentedly rapid rise in temperatures. Nice, huh? So Mann sued for defamation. Unsurprisingly, both the NRO and CEI were unhappy with this and tried to block the lawsuit using SLAPP laws—rules used to stop lawsuits that try to censor criticism. However, a District of Columbia Superior Court judge has ruled that SLAPP doesn’t apply. Mann’s lawsuit can move forward. This is real, despite lots of attempts to claim otherwise. This is great news. The judge, Natalia Combs Greene, was pretty clear that the NRO and CEI don’t have a leg to stand on to dismiss the lawsuit, saying that their SLAPP claims are not credible. She further says that “to call [Mann’s] work a sham or to question his intellect and reasoning is tantamount to an accusation of fraud.” She also notes that while proving malice on the part of NRO and CEI may be difficult, “there is … sufficient evidence to demonstrate some malice or the knowledge that the statements were false.” Therefore, Mann may continue to pursue his defamation lawsuit. The beauty of this, as Christopher Round points out in an article for PolicyMic, is that Mann has been the target of numerous investigations into his work and has been cleared of any wrongdoing every time. Since some of these investigations were prompted by NRO and CEI, they had to know he was cleared of academic fraud, yet they continued to accuse him of it. As a scientist, I find these attacks on Mann distasteful. In scientific circles you attack the research, not the researcher; that’s how science works. As a human being, I find these attacks outrageous. There can be a place for ad hominem arguments; when the focus of those arguments shows a history of hyperbolic or distorted claims, for example. But Mann has no such history, and in fact quite the opposite is true. He has been impugned by United States congressmen, the Virginia attorney general and Republican gubernatorial nominee Ken Cuccinelli—who has wasted huge amounts of taxpayer money investigating Mann for wasting taxpayer money, if you can believe it—and, of course, global-warming deniers of all stripes. Mann has done very well surviving these attacks. Of course, that’s partly because, duh, he’s right. In the arena of scientific investigation, being right is usually enough. But in the sometimes savage and merciless court of political and public opinion, it clearly is not. Even if Mann wins his defamation lawsuit, there will always be other deniers to step in, willing and able (and generally sufficiently funded) to fling whatever nonsense they can at him and other climate scientists in the hopes that something will stick. It’s astonishing just how mean-spirited and vitriolic these attacks on reality can be. But perhaps it shouldn’t be unexpected. When you don’t have facts, evidence, or science on your side, what’s left?